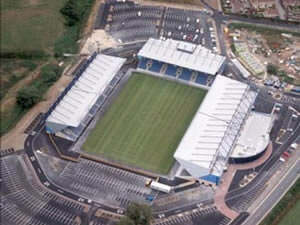 The Kassam Stadium has been built at a cost of £15 million, has a capacity of 12500, and is a state of the art stadium, complete with ground breaking multi purpose playing field. Originally started in the mid 90s, building work at Minchery Farm was halted when the club ran out of money with the result that for years the half built stands rusted and rotted and became overgrown with weeds. In 1998 a saviour came along in the shape of London hotelier Firoz Kassam who bought the club, along with plans to restart building work at the new ground. But he was thwarted for two long years as one legal wrangle after another prevented him from moving things forward. In addition to providing our team with superb facilities in which to work, the stadium also contains a superb conferencing and exhibition centre called The Quadrangle, set in the south stand behind a blue glass faade. Initially three sided, a fourth side at the west end will be erected when Mr Kassam is convinced of the city's overwhelming and continued support for the club. Building work for an hotel and leisure centre will begin later this year. This is the main Stand. It isn't the biggest Stand but is two tier. The upper tier houses the best seats in the house which are of course the most expensive. This Stand also has a restaurant and 28 executive boxes. The Family Stand is in the bottom tier. This Stand holds around 4600 seats. This is where the vocal support is expected to come from. It has the cheapest adult seats and houses around 2800. This is where the away fans will be. This Stand houses around 5000 seats and can be split into three sections. Each section holds 1800 and has its own toilets and refreshments. This is very useful because the part of the Stadium that is given to the away fans can be altered depending on how many is expected. I expect that the smallest section of the Stand will be given to away fans this season as not too many teams will bring more than 1800. Exit the M4 at Junction 13 and then follow the signs ('Oxford A34') onto the A34. Exit after 20 miles at the Hinksey Hill Interchange. This exit is signposted 'Ring Road, Oxford A4144'. At the roundabout, turn right onto the 'Ring Road'. Go for about half a mile and then go straight over the next roundabout. Then go for another mile and take the third exit at the Heyford Hill roundabout. This is signposted 'Reading A4074, Henley A4130'. You should now be on the A4074 Sandford Link Road. Exit after half a mile, signposted 'Cowley, Watlington B480, Oxford Science Park'. Then head towards 'Cowley, Watlington' and follow the signs. You are about half a mile away. Exit the M40 at Junction 9 and this is signposted 'Bicester, Aylesbury A41, Oxford A34'. At the roundabout follow signs that read 'Oxford, Newbury A34'. You are now on the A34. Exit after about 12 miles at the Hinksey Hill Interchange. This exit is signposted 'Ring Road A423' At the roundabout turn left. This is signposted 'Ring Road A423, London A40, M40'. You are now on the Ring Road. Go for about half a mile and then go straight over the next roundabout. Then go for another mile and take the third exit at the Heyford Hill roundabout. This is signposted 'Reading A4074, Henley A4130'. You should now be on the A4074 Sandford Link Road. Exit after half a mile, signposted 'Cowley, Watlington B480, Oxford Science Park'. Then head towards 'Cowley, Watlington' and follow the signs. You are about half a mile away. Leave the M40 at Junction 8. This exit is signposted 'A40 Cheltenham, Oxford'. Carry on for 6 miles and then turn left at the Headington roundabout. This is signposted 'Science Park, Cowley'. You are now on the A4142 dual carriageway. After 2 miles exit the A4142 at the Cowley Junction. This exit is signposted 'Watlington B480, Oxford Business Park'. At the roundabout turn left onto the B480. This is signposted 'Watlington, Blackbird Leys B480'. Go under the railway bridge. You will reach a roundabout after a mile. Turn right, this is signposted 'Reading A4074'. You are now on Grenoble Road. For the next three roundabouts follow signs to 'Reading, Oxford A4074' to the Stadium. Car Parking is free, what a pleasant surprise! The bad news is that it has has the usual one exit road so expect the usual car park chaos. Most traffic heads back the same way into Oxford so there will be some delay and congestion on the link road. If you are a registered user then you can login, and create your own personal review of Oxford United Football Club - The Kassam Stadium. These reviews can be private or public.